FREMONT -- Universal Com Link has completed the installation of three computers with 42" widescreen wall mounted monitors at the Fremont Ohio Probation Department. When the Probation office moved to the opposite side of the building, they wanted a way to monitor the 15 cameras located throughout the building. Their initial idea was to relocate the video recorder to their new office, but this would have required pulling all new cable to each of the 15 cameras throughout the building. UCL presented a plan to leave the recorder in place and simply access the video via a WiFi connection through their existing network and put monitors on the walls. They liked the idea so much, they decided to expand on it and install 3 systems. UCL designed and built 3 mini wall mounted fanless computers running Windows 7 Professional. UCL's Systems Engineer Brian Lee says "We went with a fanless design because this is an office situation and with these systems, there's no noise." Each computer is connected via a single wireless router which transmits the data from the video recorder through the network. The wall mounts holding the large 42" monitors allow for tilting to give a clear view of the multiple camera video system. A wireless keyboard and mouse allows the user to access different cameras within the software. With the new system, the probation department can now watch the building's camera system without tying up their desktop computer monitor. FREMONT -- The Federal Communication Commission recently sent narrowbanding reminder letters to 32,000 public-safety licensees that still have a wideband-emission designator on their UHF or VHF license. Surveys show that many licensees are still operating on 25 kHz channels in the VHF and UHF land mobile radio frequency bands even though the FCC deadline to cease all such operations is less than two years away. The transition to compliant 12.5 kHz operation doesn’t necessarily mean you need new equipment. Manufacturers have been preparing for this transition for 15 years, so many new radios – analog or digital – meet the new standards. If you purchased your radios in the last 10 years or so, it most likely just takes a software change to operate in 12.5 kHz. Conduct an inventory of your current radio equipment. Depending on your system age, change in operational requirements or need for enhanced radio and network features, this may be a great opportunity for you to consider the benefits of migrating to a digital system. Now is the time to start planning. UCL is a complete radio communications solutions provider whose staff has more than 20 years of experience in radio communications, security, telemetry, automation, mobile and fixed data systems. Contact us today for input and ideas on the least expensive way to upgrade your radio systems. FREMONT -- Universal Com Link specializes in data communications systems, and is building the next generation in mobile computer wireless systems here in town for first responders and industrial applications. These customizable systems can handle critical system monitoring, automation, telemetry, digital video and a wide array of software packages. With the help of UCL, the Fremont Police Department now has 17 computer and video systems to equip its cruisers with updated technology. Police officers have access to digital traffic and criminal databases and can automatically record digital video. Other customers include the Western Regional Transit Authority in Youngstown, which is outfitting its buses with new radio, computer and video gear along with a new communications system and dispatch center. UCL has also installed systems for Toledo's TARTA and TARPS, the Birmingham Alabama Police Department and the Alaska oil pipeline. "We bring together computers, two-way radio, WiFi networking systems and make it work together for moving data," UCL systems consultant John Lucas said. UCL also carries a line of mobile digital video recording systems for recording video on school and transit buses and police cruisers. The MobileDVRpro series is a professional system that can handle video from one to 32 cameras and up to 32 microphones at once, as well as monitoring location, when the lights and sirens are active, speed of the vehicle, when a door is opened and even when the brake is pressed. Cameras can include infrared illumination if the customer needs night vision. All information and video can then be automatically downloaded to the main computer at the station when the vehicle returns at the end of a shift. Information and live video from the vehicle can be monitored anytime at the station via a wireless connection. Accurate vehicle information and video helps in fleet maintenance and reporting, and if need be, accident reconstruction. "We have transportation management software," Lucas said, noting the package is for tracking buses and has two-way texting between the bus and dispatch center, and allows for sending route information. Schools can get a program known as BusOnePro that can be used for planning bus routes and allows for plugging in students names and addresses. UCL is a complete radio communications solutions provider whose staff has more than 20 years of experience in radio communications, security, telemetry, automation, mobile and fixed data systems. Owner and Chief Engineer, Brian Lee has done consulting in this line of work for more than 20 years. He then got into robotics, which led to the electronics side. 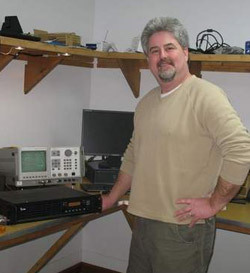 Rick Sherer, an FCC Licensed Technician with UCL, has been in the business since 1976. Lucas says there are also employees who travel doing installation work all over the country and world. FREMONT -- Every Fremont Police officer will soon have access to digital traffic and criminal databases in their cruisers and can automatically record digital video. The department has agreed to purchase 17 computer and video systems, which means all cruisers will soon be equipped with the technology. The bottom-line price of $49,572 to purchase the equipment was covered by a combination of forfeiture funds, mandatory court fines and charitable gaming proceeds from organizations like the Moose and Eagles. "None of this came from our police budget," Chief Tim Wiersma said. "This is not taxpayer money." Wiersma said "They did give us a good price." Capt. James White said the tiny cameras mounted on the dash of each cruiser provide much higher-quality video and allow more advanced viewing after video is recorded than the older VHS-based equipment previously used in their cars. "We are really trying to modernize the police department equipment-wise," White said. People have always over-estimated police technology after watching television shows that tout the latest-greatest law enforcement gadgets that most small departments like Fremont cannot afford, White said. For instance, a driver will often expect that an officer can show them video of their vehicle swerving after pulling them over for reckless driving, he said. Previously, the department had seven VHS recording systems in its cruisers, two older digital systems and four portable laptops to scan criminal databases. With the new system, each marked cruiser will be able to access the databases and record video anytime they are near the car. "I think this is a great thing for the police department," he said. "We need to have this stuff in our cruisers for our officers' safety as well as our citizens' safety." The system will also include software for writing traffic tickets and a card-swipe for officers to pull up a driver's pertinent information simply by sliding their license through the reader. John Lucas, a representative from Universal Com Link, said in the future the department could add other features to the system, like a wireless network that would allow data to be automatically downloaded to a central server while cruisers are parked at the police station. Universal Com Link opened its doors about a year ago and employees said they were happy to provide the police department with the equipment, hoping to show them off to other agencies as an example of what they can provide. Though this is the company's first contract with a police department, he said, the owner has worked in the industry for 25 years and equipped large agencies including the Birmingham Police Department in Alabama. 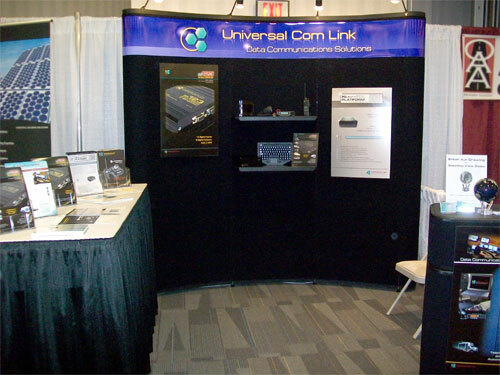 Universal Com Link was set up at the 2010 County Commissioners/County Engineers Winter Conference in Columbus, Ohio on December 6th and 7th. UCL's Sales Consultant Samantha Lee and Systems Consultant John Lucas were showing the latest technology in industrial computers and mobile/fixed telemetry. Featured products were the HeavyPC6platform™ Industrial Computer and the SR123™ Radio Modem. The Fremont Ohio Police Department is outfitting approximately 18 of their cruisers with Universal Com Link's CruiserPC6platform™ mobile computer system. UCL's mobile platforms are designed and built using all industrial components. The chosen system will feature a Pentium Duo-Core processor with a 1066MHz front side bus, 3Gig of memory, and a 320Gig Industrial hard drive. For the officer interface, a 12.1" touchscreen DOT approved monitor was selected along with a space-saving keyboard. A high-res camera will record video in front of the cruiser while a second camera with a microphone records the vehicle interior for statements. The first system was installed in the Department's new Ford Explorer. Also in the works is a new reporting/database system for officers to file reports. When complete, the system will automatically interface with the department server and download data when the cruisers return to the station.